HP Inc's Sprocket printer - a hot (make that scorching) holiday gift item! It started with toys, as I remember. The hot item that was in short supply during peak shopping season, and crazed parents would go to any length to get their kid the product of the year. I recall Cabbage Patch dolls, Furbees, and Teddy Ruxpin - the latter being the one I proudly "scored" for unwrapping under the tree. Those feeding frenzies were before the widespread adoption of the internet and auction/shopping sites like eBay, which may have even upped the ante. The incursion of tech also played into the equation on the in-demand product side, too. It also became a not-particularly-holiday-driven phenomenon (I'm leaving out those pup-tent dwellers outside Best Buy for days before Black Friday). For a number of years (and mostly missing my demographic) the hot items were mostly things like the latest video game consoles. But I got back into it, at least as a very interested observer, when my Google Glass, purchased from the company as part of the Explorer program for $1500, and seeing those being offered for between $3,000 and $5,000 on eBay during the latter months of 2013. (See my post http://googleglasshalffull.blogspot.com/2013/10/google-glass-economics-update.html - note that was on another blog, which I had established as my personal contribution to the Glass hype of that year). 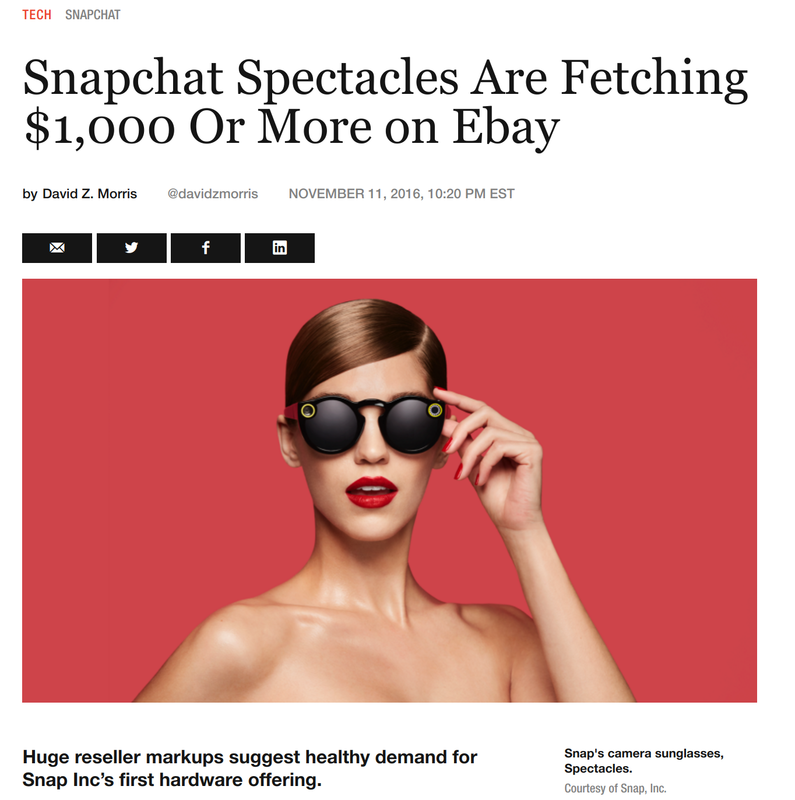 So connecting the dots from those early shopping frenzies leading up to Google Glass, one might conclude that Snapchat Spectacles would be the high-premium item this year. With their sketchy retail availability and "cool" factor, that was definitely true, as least a month ago, though eBay prices (bids and offers) have slipped significantly recently, down to a few hundred dollars. HP Shopping and other retailers are sold out! 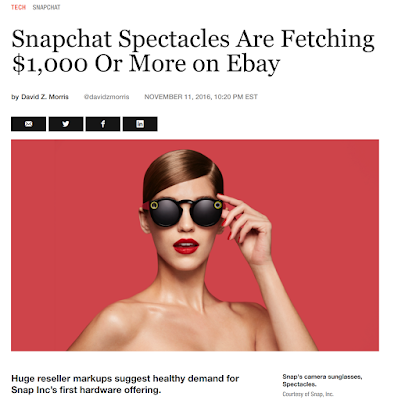 And currently up there with the Spectacles' eBay-to-list-price ratio right now? 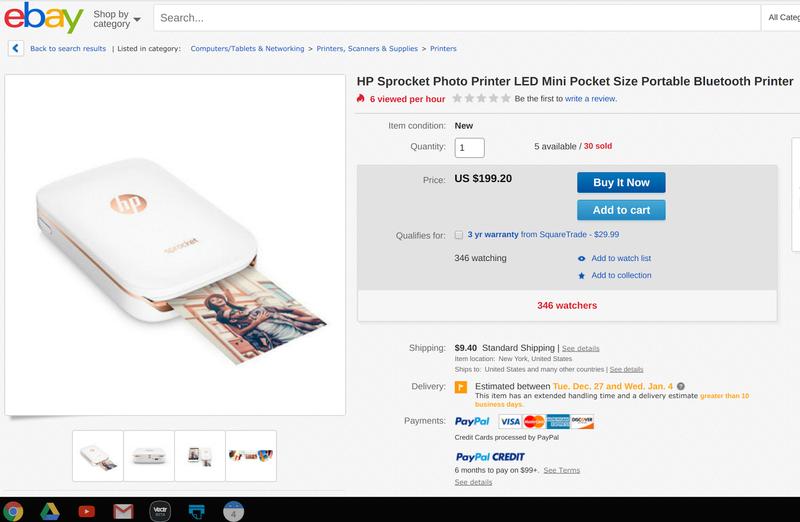 It's the pocket-sized HP Sprocket Photo Printer, introduced early this year. I had posted about its appearance in the HP Q4 Earnings briefing deck in November as an HP Inc. Printing and Imaging highlight, and on further investigation which I had promised last week, lo and behold, it's a holiday season phenom! 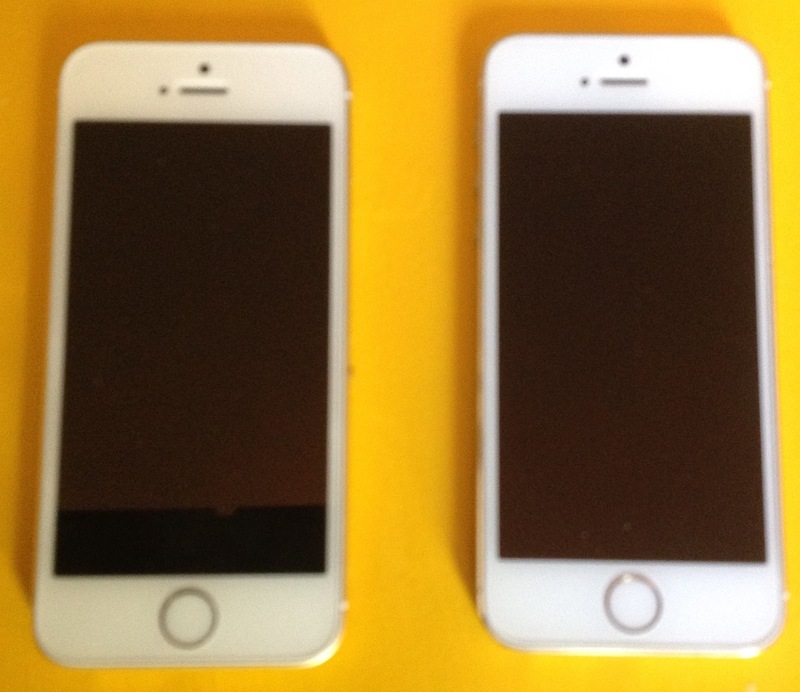 More coming on its speeds and feeds in a future post, when I can get my hands on one!!! Wow! Checking my last post (which announced the end of my regular monthly "Observations"), I was good to my word - nothing at all for the months of October or November. But with the feeling that it's been too long, here I am with some reflections on HP's printing results for its fourth quarter, which ended October 31st and was reported a few weeks later. Overall, the numbers were not good, with a continuing decrease in quarterly revenues, as compared to prior years. 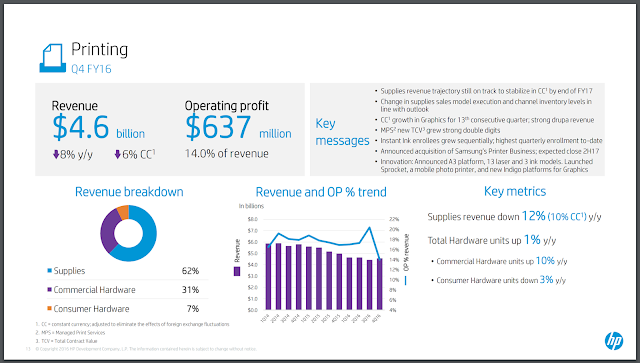 A few glimmers of hope made it into the numbers (commercial hardware units and revenues ticked up a bit for example), but I was particular intrigued by what made it into a bullet point on the slide I have inserted above. They included a final bullet as follows: "Innovation: Announced A3 platform, 13 laser and 3 ink models. Launched Sprocket, a mobile photo printer, and new Indigo platforms for Graphics", which got my attention and has had me thinking ever since! Perhaps it is the convergence with my own life? I have been spending much of my time lately (while I was not blogging) teaching a class called "Product Design and Development", and if there is a single key word to describe that class, it would be "innovation". Or maybe seeing a mobile photo printer named Sprocket make it to HP Printing's short list has been what's caused my curiosity to linger? One thing I learned during my career actually involved in development projects is that, consistent with the old adage about "a watched pot never boils", stepping away from the action for awhile does have the effect of making those aforementioned projects seem to move along much faster! So maybe this is going on, but regardless, it seems the HP Sprocket is screaming for some investigation and reporting on my part. So as I so often ended my regular Observations, stay tuned! Getting ready to “file” my monthly “Observations” for the 130th time since its debut in December 2005 in the Hard Copy Observer, it dawned on me (actually after much thought) that it was time to announce a change. To review a little history (always a sweet spot for me), I had a great career with Hewlett-Packard beginning in 1981 that stretched 25 years until the end of 2005, with most it affiliated with the incredible rise of HP and the LaserJet (and other) printers. At that point, offered an “Early Retirement Package” that fit well with the idea that there other things I wanted to do, I made the difficult decision to leave the friendly (most of the time) confines of HP, resisting the “retirement” part of the deal. Those “things” have included teaching and consulting, but more relevant here, I also started writing my “Observations”, addressing topics in the Printing and Imaging industry - and I haved loved covering many of the developments since then. My nascent activity as a blogger/analyst expanded to work with three respected publishing/research companies, and I am grateful for their support, starting with the Observer in late 2005 and my first column. It has turned into a great second career, and even with a sabbatical in 2015, I have continued to crank out something every month, with generally great enthusiasm. As far as “retirement”, I have wondered what it would be that would trigger the feeling that I really am retired, at least as far as the aforementioned “blogger/analyst” role. Friends and authors told me that “I would know when it was time”, and that has finally happened. The “writing was on the wall” earlier this month with the announced acquisition by HP of the Samsung printing business. Prior to the official announcement, I was unaware of rumors the week prior (which in retrospect told me a lot), but I did note the acquisition news in a blog post on September 12th, though it was of a historical nature. 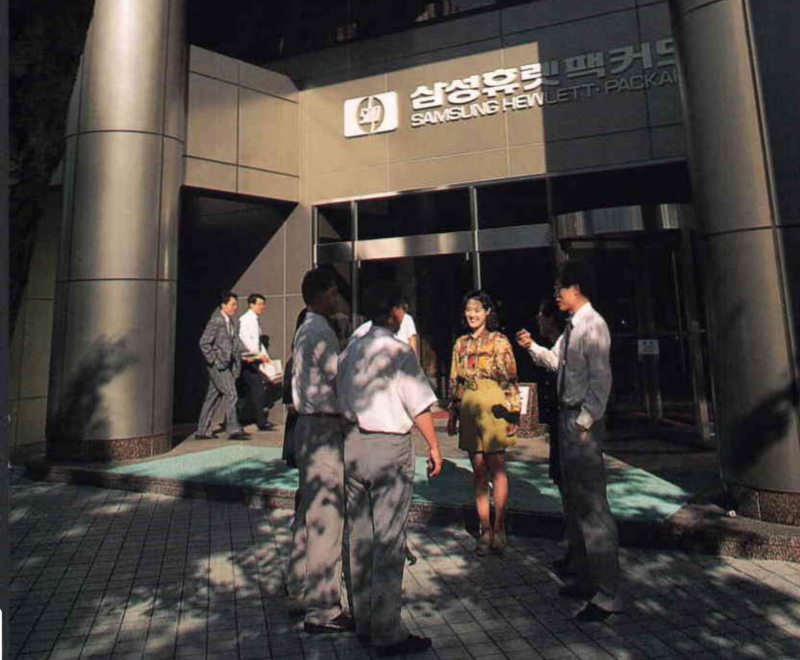 (See “HP buys Samsung's Printer/Copier Unit - the more things change...). And while reading that day’s HP release, watching HP CEO Dion Weisler’s comments on CNBC, and talking to a few industry friends, I realized the time had come - I really had no excitement or enthusiasm for the deal or the strategy behind it. That, my readers, was the “writing on the wall” - I realized I am no longer interested in what goes on in the industry (that has been so good to me), at least not interested enough to crank out a monthly column. I will continue to post “Observations” from time to time, and they might even include things about printing and imaging, but my “streak” on monthly posts has ended - not bad, if I say so myself, at 130! Breaking news this morning across the business world is HP's somewhat surprising $1 Billion acquisition of Samsung's printer business. The move is touted by HP as a path into the copier business, taking advantage of an A3 product line currently designed, manufactured and marketed by Samsung. It’s that time of the year when the days suddenly seem noticeably shorter, the leaves start to show a little color, and neighborhood kids clearly exhibit different behavior patterns. Though it varies around the country, our area typically begins its school year the final week of August, including everyone from kindergarten to university level. So what better time to get myself a new Chromebook? But what’s the connection? The Chromebook could be called the darling of educational computers these days – a search on Google for “Chromebook Education” returns nearly 600,000 hits, and CNBC reported in December that over half the computers sold to schools are now Chromebooks. The simplicity of Chromebooks’ hardware typically translates to excellent prices, and their connection to the Internet, with apps oriented to run in the cloud, means a level of sharing and collaboration that comes, more or less, with the Chromebook culture, and benefits the educators talk about. 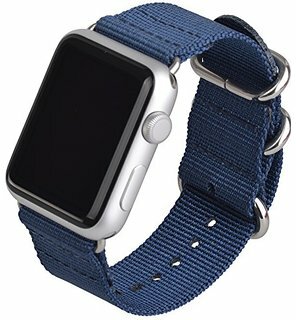 But for everything else in my life, computer traits of simplicity, thrift, and portability, which includes excellent battery life, are top priorities. And for these reasons, I was drawn to Chromebooks from the very beginning, and for well over a year, my favorite, everyday computer for home or travel has been a very simple HP Chromebook, which I bought refurbished from Woot, for a fantastic price. Before continuing on with my Chromebook saga, I should summarize the feature tradeoffs/preferences which cause me to favor the Chromebook over the iPad for daily use, tablet computers being a category where I have been an early adopter too. At the very top of the list is a full-size (or near enough) QWERTY keyboard. Writing posts, sending emails, and keeping up on social media all require lots of typing, and for me there is no comparison between the two form factors for creating text, and it becomes the deciding factor without having to go down the list to tradeoff number two. The new Chromebook seems like a great choice, and unlike my Invisible Upgrades this Spring, it’s a metal-plated beauty that is noticeably snappier and with a much better screen. I am very happy with my HP and the upgrade it offers over the faithful but failing turquoise model. In addition to a great price, like my previous Chromebooks, this one is fast to start up, easy to carry around, and very good on battery life. Just one thing has been bothering me…what about Chromebook Printing? I hear some good and not-so-good things and we definitely need to drill down in my next Observations. Two of the tech industry's household names have joined! 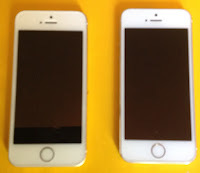 Of interest to readers of this blog, I've covered both with a printing angle. Starting in 2011 with "February Observations: If It Sounds Like Print and Looks Like Print, Is It Printing? ", and then "Pinterest Printing" earlier this year, and I think it's a very interesting development. Whether this consolidation will make for more printing from users, stay tuned! I have used Google Blogger, aka Blogspot, for over ten years now, as the primary platform for this blog. I am now moving to Medium for my final publishing target. While most posts will be available in something less-than-complete, I have found Blogger's formatting, editing, and overall usability to be very confining and at times quite frustrating. It's been a good run though! See July's Observations in a form which flatters the writer and hopefully pleases the reader! Product innovation leading to business success can take many forms, as it turns out. In my May Observations (see "Time names HP Deskjet as 35th 'Most Influential Gadget'"), I started with the HP Deskjet printer’s recent inclusion on as one of the 50 most influential gadgets of all time. As the Time list’s description points out, the Deskjet’s influence has to do with its fundamental technology and its link to HP’s recent entry into the futuristic world of 3D printing. But what other entries of note can be found on the Deskjet family tree? This month I take a look at some less-than-direct descendants as well as some other tech innovation examples. My motivation for a deeper dive can be attributed to the fact that I have always enjoyed these stories of innovation, but also, in preparing to teach another round of “Product Design and Development” to a group of graduate students in University of Phoenix’s MBA program. The “PD and D” class is the final marketing elective option in the curriculum, for those specializing in marketing, so it never hurts to brush up a bit! In my goal to be prepared, I have been reviewing some of the thinking in our text on product innovation. The HP Jet Fusion 3D Printing solution has technology roots that can be linked to the original Deskjet printer. So starting with recently detailed 3D Printing offering from HP Inc, the HP Jet Fusion 3D Printing Solution represents the type of innovation story that most people can’t resist. The result of years (decades actually) of tireless research, originally focused on something much more pedestrian (in this case, the humble HP Deskjet printer), is now deployed in a dramatic new application of the technology that results in a world-changing solution. Time will tell on that “world-changing” part, but again, there is no more classic an innovation tale than this one. But what about variations on this theme? 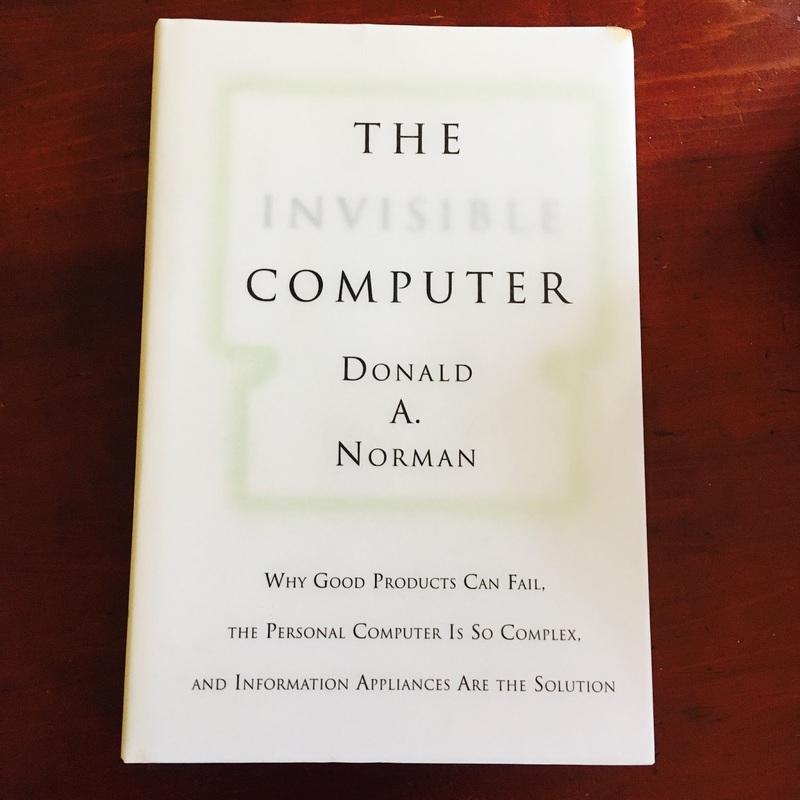 Everyone seems to love the story of internally developed technology finding its way into new, even surprising, applications and markets – but it might even be better, at least from a story-telling standpoint, when the technology deployed has been initially dismissed as a failure. This is a “rags to riches” kind of tale that keeps Hollywood afloat, and 3M Post-it notes are a favorite example– the adhesive that “wasn’t sticky enough” but ended up creating a whole new product category and even one could argue a new and improved form of office communication. So there’s one model, the intended long-term investment in technology, with one variation, with the common thread that both HP 3D Printing and 3M Post-it Notes remained under the same corporate roof through their development life cycles. But what about a technology that is transferred between entities and takes on new ownership? But what about the other way around? What happens when an innovation-intensive corporate culture begins to over-fill the pipeline with technology building blocks of their own design? Sometimes, independent units of “intrapreneurs” are organized to attempt to capitalize on the “raw material” generated by teams of engineers and research labs. Going back to my years with HP and the Imaging and Printing Group (before I departed in late 2005), the site in Corvallis, Oregon had a New Business Creation organization centered there, with emphasis on using the intellectual property generated around inkjet printing to apply to other fields, some more closely related but with others very distant. For example, I remember a number of ideas aligned around dispensing patient prescriptions via inkjet-based devices, but none of those had commercial market success. In good HP engineering-culture fashion, the “NBC” process had been broken down into a series of steps, many if not most of them metric-driven. Typical of the thinking of that time (the “Fiorina era” for lack of a better label), future growth for the company was foreseen as coming from a few “big bets” with plenty of “wood behind the arrow”. A typical "hurdle rate" for the new business ideas was something that could be seen growing into a “billion dollar [in annual revenue] business”, a target which can end up being more than a little daunting. But what about a more unusual approach, divesting the internally developed technology to a group of entrepreneurs who might just be able to focus down enough to find market success but measured, at least initially, on a much more modest scale? Tim Koch (pronounced the same though spelled differently than the Apple CEO) is a long-time HP engineering manager, who along with another HP veteran from the business side of the house, departed the company in 2013, effectively taking a technology with him. He is now Chief Technology Officer for 3D Nanocolor, based in Corvallis, Oregon, in rented space that is on the same site that still houses Hewlett Packard and goes back to the calculator days. Marathon Patent Group acquired HP imaging technology, which they are attempting to commercialize through 3D Nanocolor, a subsidiary, in the area of smart or dynamic glass. Beyond owning the technology, another advantage in its favor is the startup is managed by two long-term veterans of HP technology businesses. Automotive is one area 3D Nanocolor is pursuing as a potential customer for its dynamic glass. In a recent conversation with Koch, we discussed innovation and what it takes to convert basic technology to a commercially successful product. Having experienced the NBC process and its overly high expectations (we overlapped but never knew each other during our respective HP careers), Koch’s insight into the current innovation challenge is impressive and seems perfectly suited to the challenge at hand. “It’s critical in our role to not try to do something terribly complex,” he told me, and the company is well along the path to market penetration. 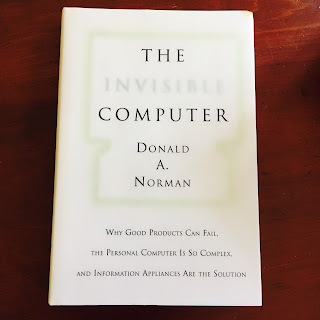 As he states, “the story is yet to be told…” but again going back to my textbook, sometimes multiple, small steps can be far more effective in innovation than one giant one. So betting my long-time readers, those who have been with me for most if not all of my now 10-plus years of Jim Lyons Observations, may get tired of this, we will be watching and waiting for further news from 3D Nanocolor and other HP Deskjet technology descendants! As I read about the decline in HP Inc's ($HPQ) share price in today's stock market, and the reasons behind it (see "HP Hits a Jam with Printers"), I immediately thought of some anecdotal data I gathered earlier this week. In the proud marketing research traditions of "the focus group of one" and "the last customer I talked to", let me explore what could be going on behind these observations. I found myself in an Office Depot ($ODP) for the first time in a long time, and in addition to looking for another supply item (whiteboard markers), I needed to buy a ream or two of printer paper. This was my first paper purchase in quite some time - I am guessing at least a year - and our multiple home and office printers were all in need of paper reloads. Teased on the front, the back of the paper package has details. I was a bit surprised by the pricing, having remembered basic copier/printer paper typically at under $5 a ream, sometimes well under, but I finally found a deal on Hammermill (brand name - nice!) at $10 for two. (Though $6.99 for one - I hate that!) So I grabbed my two reams, along with the markers, paid at the front and exited, with the courteous checker reminding me that my receipt included a coupon to be used on my next visit, for "25% off (selected) printer ink products, when buying two or more," or something like that. Again, these complicated and restrictive offers annoy me! Getting the paper back home (actually on the front seat of the car while driving back home), I noticed details on the packaging that I found fascinating. 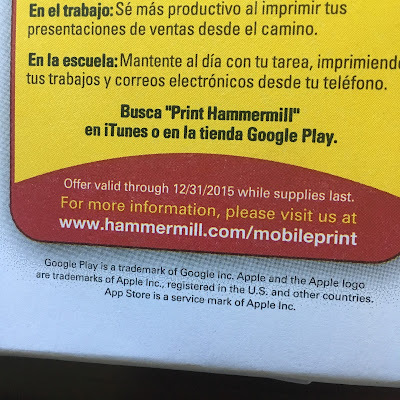 Both the front (teaser) and the back (details) touted a Hammermill smartphone printing app, named "Print Hammermill". Offering basic mobile printing functionality, their app seems to do what many others have already provided, but at least I like their three customer-need-based scenarios, from home, work, and school. As a blogger/analyst following the development of mobile printing from the beginning (see April, 2008, "iPhone Printing Revisited", for example), at one time I probably would have been thrilled to see this, as further validation of an important imaging and printing trend. "It's not just printer OEMs and a handful of mobile apps startups..." - I can see the opening line of my post now, in 2010 or 2012, maybe. In mid-2016, it now seems unnecessary and even somewhat desperate. While supplies last! 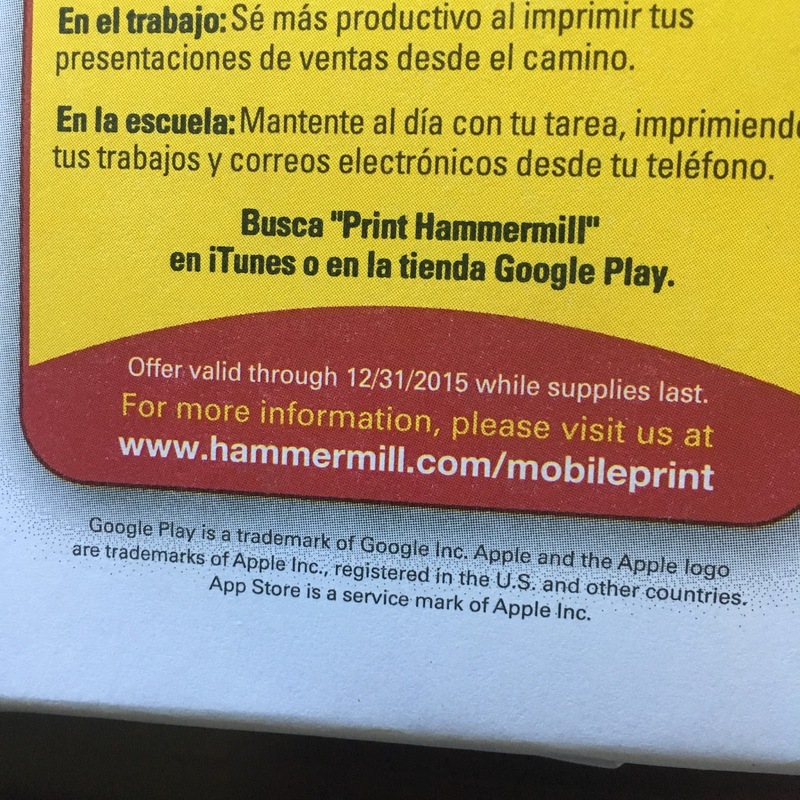 "Valid through 12/31/2015" says something, too. What I found more than a little strange however, but again keeping with grand marketing traditions, was the limited-time "offer" that the app could be downloaded free, from both Apple's App Store and the Google Play equivalent, for iOS and Android mobile devices, respectively. The tease on the front dared to declare a "$12.95 Value", only continuing, per the details in fine print on the back, "until 12/31/15", or "while supplies last". And just how are supplies exhausted with a downloadable software app? I am not sure. Supplies must have lasted! App store screenshot from June 2016 shows the free app - newly revised - still available. I had a few further take-aways, as well. While no "fresh-until date" applies to copier/printer paper, the fact that the expiration date of the offer is six months past tells me that paper - like other printer supplies - is just not moving like it used to, at least through the Office Products channel represented by one Office Depot in Boise. And the continuing presence of the app, with a new version as of May and still free on the Apple App Store (see above), is a good sign. However, the web address offered on the packaging is a dead end, at least when I try it today, so the enthusiasm by International Paper (supplier of Hammermill) is a bit of a mixed bag, at least as seen by this observer. And before I get too snarky about the app itself, the App Store reviews going along with the 10 ratings for the new version were glowing. The "all versions" screen shows a 5-star average for 498 ratings, with a sampling of the reviews (not unexpectedly) very positive as well. NOTE - Last Observations I promised a further look at spin-off technologies from HP's printer unit. That topic will be covered in my July Observations. 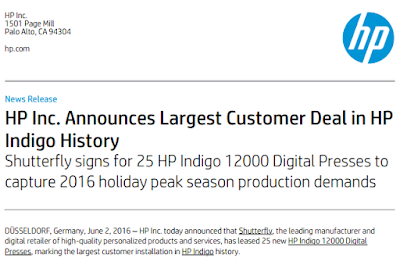 HP and Shutterfly announce largest Indigo deal ever - partners for over 15 (or almost 10) years? Presses, marking the largest customer installation in HP Indigo history." 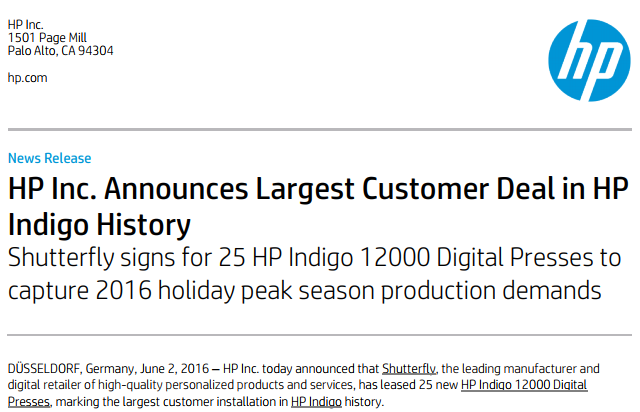 HP has a Shutterfly "success story" on its website, with a PDF dating back to 2005, recounting the company's history with HP Indigo presses. And per Cary Sherburne's recent account of the deal at "What They Think", HP/Indigo's Alon Bar-Shany is quoted as saying that Shutterfly has been an "Indigo customer for more than 15 years", which would go back to before HP's 2002 acquisition of the Israel-based firm. All that makes sense to me, having been around as an insider leading up to and following the aforementioned acquisition. I was also around for the rather awkward discussions between Shutterfly and HP, when another acquisition occurred. It was the deal, also in 2005, in which HP bought Snapfish, a leading Shutterfly competitor. That came much nearer to my exit as an HP employee, but I was around to witness some tense interactions between the companies, with Shutterfly challenging HP judgement and intention in buying their leading customer's (Shutterly's) fiercest foe. Could it be 15 years as a customer but only a collaborator for "better part of a decade"? Things were clearly resolved over time, and HP dumped Snapfish last year in an anti-climatic deal. (See "HP sells Snapfish - cites 'focus'".) But maybe there's an explanation here, for why in this month's release, Shutterfly exec Dwayne Black cites collaboration spanning the better part of a decade!